Male Male Rubber Bobbin Mounts, sometimes referred to as Type A Bobbins or Type 1 Bobbins, are a low cost Anti-Vibration solution to reducing vibration & shock. They can be used in either Compression or Shear or a combination, and are available with various thread configurations. Additional Sizes are available, Plus Stainless Steel metals and Oil Resistant / High Temperature rubbers available on request. Applications include - General Purpose mountings, where a Male / Male Fixing is preferred. Popular in a wide range of applications & industries including Air Conditioning Units, Exhaust Mounts, Diesel Engines, Generator Sets, Instruments, Industrial Machinery & Equipment. Weight range from 1kg to 2000Kg per mounting. Male Female Rubber Bobbin Mounts, sometimes referred to as Type B Bobbin or Type 2 Bobbins. 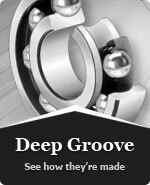 They are a low cost solution to reducing vibration & shock, and are used in applications where a bolt fixing is required. They can be used in either Compression or Shear or a combination of both, and can be produced with different thread variations. Many additional sizes are also offered, and the Bobbins can also be produced in Stainless Steel metals and Oil Resistant & High Temperature rubbers. Applications include - General Purpose mountings, where a Male / Female connection is required. Suitable for a wide range of applications & industries which may include Diesel Engines, Gen Sets, Instrumentation, Industrial Machines & Equipment. Weight range from 1kg to 2000Kg per mount. Applications include - Female / Female Bobbins are a general purpose mounting solution, popular in many different applications & industries including IC Engines, Generating Sets, Instrument Panels, electronics & various types of Industrial Equipment. Weight range from 1kg to 2000Kg per Bobbin.